The House Democratic Leader explains, "The president is just saying, 'Stop the world.' He wants to get off, because he doesn't know how to deal." As told to THINK editor Megan Carpentier; edited for clarity. What the president is doing, it's violent. His actions are violent. He does violence to what we want to do in health care. He does violence to the national debt by what he is adding to it. He does violence to the world, in terms of nuclear proliferation and the environment and our standing in the world, with his frivolity. What we want him to do is to calm down, get used to the job he has, know that his words weigh a ton, and that he really should know what he's talking about when he says something. For instance, I don't think that the president or the people around him know that much about health insurance, so he went down the wrong path. The bigger the pool of people buying insurance, the cheaper the premiums are, and the healthier the pool is economically. What he's doing is dividing the pool so that some people will end up paying much more. He's going to make it very hard for people to be able to afford insurance if they have a pre-existing medical condition. The American Cancer Society put out a statement after his executive order; he's really dangerous to people with cancer. But he can't pass the bill to undo the Affordable Care Act, nobody supports Trumpcare and he keeps insisting that he's going to get it done. I don't believe that he even knows what the right thing to do is, because he doesn't know enough about health care reform to make a proper proposal on how to improve it. Instead, the president is engaged in a sabotage effort to undo the Affordable Care Act and doing so, he is doing violence to the good health of the American people. I also don't know that the president fully understands his own tax bill; it is not a tax break for the middle class. It will increase the deficit, and it gives tax breaks to the high earners. It will curb our opportunities to invest in middle class issues, in terms of the education of people's children, investments in health care to lower costs for consumers, and all the rest. And he doesn't know enough about international relations to know how to avoid provoking the president of North Korea. It's ridiculous; he's the president of the United States. He shouldn't be provoking a punk who is the president of North Korea, but he is. He's giving him almost equal status on the world stage with the back and forth, which I think is a big mistake. Plus, walking away from the Paris Agreement after 194 countries signed on to that? He's saying, "No, America won't participate in that," though it affects the air our children breathe and water they drink. Then he’s setting up a situation to leave the Iran Agreement, which is very important to the security of the world. If Iran were to get a nuclear weapon — which they could do if we didn't have this agreement — then it wouldn't be long before other countries in the Middle East would have such a weapon. And that type of proliferation would make the world a very dangerous place. Absent a violation by the Iranians, the Europeans, the Russians and the Chinese are fortunately sticking with the agreement, whether the U.S. leaves or not. The president has no evidence that they are in violation; he's refusing to certify just because he feels like it. It’s so irresponsible. In effect, the president is just saying, "Stop the world." He wants to get off, because he doesn't know how to deal with any of these issues. He keeps shrinking into this little world of his own, and it's really dangerous to children and to the entire planet. Plus, his tweets are beneath the dignity of the president. Not that a president can't tweet, but as the primary mode of communication to the American people, it's such a disrespectful way to engage. The fact is that, 10 months into his presidency, there's no jobs bill. There's no infrastructure bill, no legislation to protect DREAMers, no bill that relates to tax reform, no gun violence prevention. The list goes on and on. He can't be too proud of any list of accomplishments. But of course, he will say that he is. Despite that, we want to move forward and work with him, to develop a big infrastructure initiative that will support good paying jobs in our country. We want to work with him to do real tax reform. But unfortunately he is proposing tax cuts for rich people that will increase the deficit and destroy some of our opportunities for investing in our children's future. We think that there's plenty of room to find common ground on comprehensive immigration reform. But when that person shows up with an open mind for evidence, and data, and facts, and the truth about the situation, we'll have a better chance to do that. In the meantime, it's about how we communicate with the American people. As Democrats, we have to make the contrast. Our House Democratic Caucus, working with the Senate Democrats, came forward with A Better Deal: Better Jobs, Better Wages, a Better Future. We can equip people with the tools to take their families and their children into the jobs for the 21st century, and lower some of the costs that their families incur because of monopolies and other exploitation of the market place. We are unified by that commitment to America's working families, and that is what Democrats are conveying to the public. Abraham Lincoln said "public sentiment is everything," and we have to convince the American people of a different path than he has proposed. 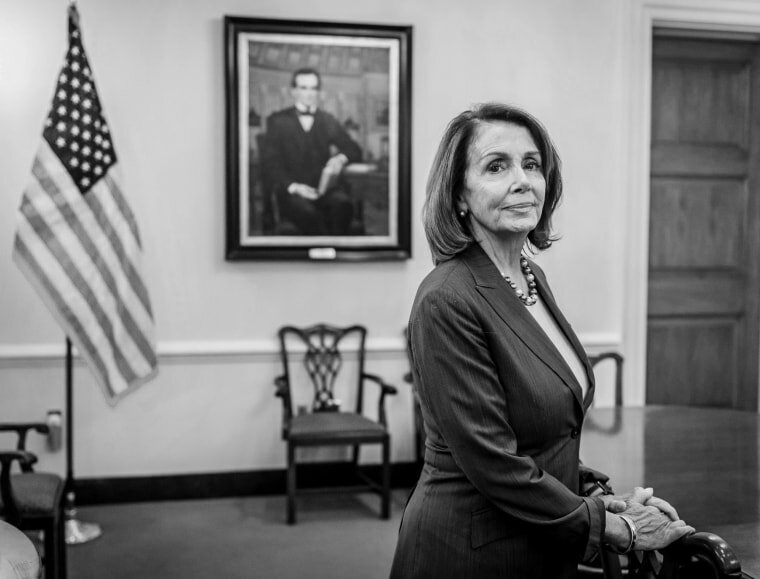 Nancy Pelosi is the House Democratic Leader. 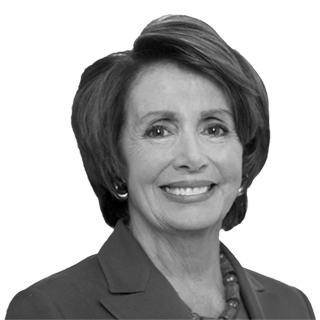 Nancy Pelosi is the House Democratic Leader of the United States House of Representatives, representing California's 12th congressional district.